Zombie companies accounted for almost one-fifth of the Atlantic Canadian startup community. In case you were confused, No. 1 is the good news and No. 2 the bad. We needed more failures, and likely need more still. One of the hallmarks of a healthy startup community is that entrepreneurs experiment quickly and respond quickly. If the experiment doesn’t work, they shut down and move on. But Atlantic Canada is known for its readily available grants and penalty-free loans, so it’s easier for companies to linger here than in other startup communities. That’s changing. 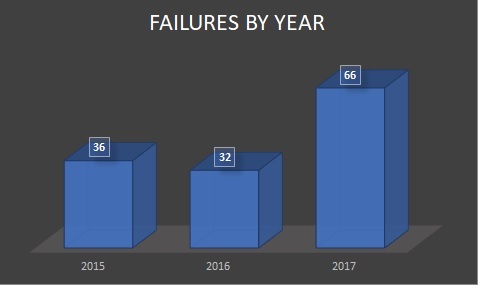 For the first time, we’re reporting a dramatic increase in the number of failures. In 2017, we learned of 66 companies that were no longer a going concern. That’s roughly double the 32 failures in 2016 and 36 in 2015. Of these 66 companies, 31 were less than two years old, and 53 were IT companies. This suggests that a large proportion of the companies were experiments and likely didn’t have employees who lost their jobs. Yet, 16 of the companies had raised capital. Looking at the community today, we believe this trend has to continue. We tracked 486 startups across the region last year and estimate that about 90 of them were zombie companies. When I mentioned zombies in an article last week, I got a few questions on what exactly I meant by zombies. Well, they’re the walking dead. These are companies older than two years that have not shut down, but they’re not moving forward. They probably have a bit of money in the bank, but the founders have not joined full time and there’s no sign that they’re getting closer to the market. What we found is that 37 of the companies, or 41 percent, were founded in 2015, and then the numbers dropped dramatically as the companies got older. It suggests there will always be a group of companies that spend two to three years experimenting, pivoting, and eventually dropping off. Almost three-quarters of the zombies are IT companies, which makes sense. These companies require minimal investment. The founders can just hold on to the digital assets with no expenditure while they work another job and figure out what to do with their companies. Why is it important to reduce the zombies? Because they tie up human resources as well as financial resources. And those resources are often needed by companies that are growing. The community needs the constant churn of birth and death, and we’re beginning to hit a healthy mix. The business of startups never slows down. Sign up here for updates wherever you are, whenever they happen.